The Invasion of the Stink Bugs! Over the last few weeks, we’ve seen a big increase in the number of pests showing up in the lawn and landscape. 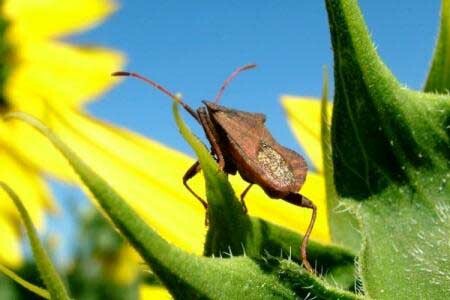 If you spend time in your garden, you may have noticed insect like stink bugs hatching out recently. There are several species of stink bug, with the Southern Green Stink Bug being the most common in our Texas gardens. Stink bugs will feed on your garden and vegetable plants and so you should consider them a pest you’ll want to knock down. Stink bugs damage plants by piercing the outer “skin” of leaves, fruits and vegetables, which not only ruins there appearance but can also make them inedible. The Brown Marmorated Stink Bug has started making its way into Texas and you’ll need to keep a close eye out for this invasive pest. This non-native stink bug produces foul odors when they enter homes in late-fall, looking for shelter from winter temperatures. Right now, they’ll be hanging out in your landscape, so now’s the time to spot them. They also cause major damage to agricultural crops. They do have a similar appearance to the native stink bugs, so if you spot any stink bugs, it’s a good idea to give us a call. One good thing is that stink bugs don’t often travel too far from their original point of infestation. This can make it easier to treat for them. Take care to distinguish between stink bugs and assassin bugs, which are most often beneficial insects in the landscape. Stink bugs and assassin bugs can have a similar appearance, so sometimes it can be difficult for a homeowner to tell them apart. If you aren’t sure, take note of whether or not there are many insects together, or only one or two by themselves. Assassin bugs are usually larger and are often found by themselves protecting a specific territory.